Interested in starting an apprenticeship program in your company? • Start by identifying a real talent need in your organization. • Make it part of the operating fabric of the company so it's supported and results in immediate application of learning. • Open up new avenues to finding talent – the "earn while you learn" feature of apprenticeships gives you access to a wider talent pool. 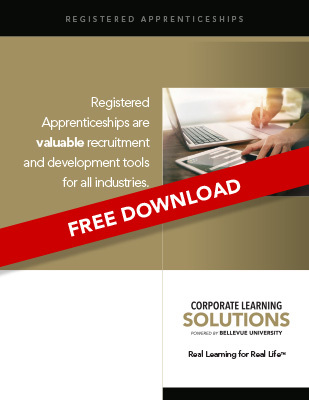 Registered Apprenticeships – the "Gold Standard"
The most effective apprenticeship programs include both college learning and on-the-job learning – working together. The U.S. Department of Labor works with companies and universities to design "Gold Standard" apprenticeship programs. Bellevue University is one of a few 4-year schools that participates nationwide. Work with us to create a Registered Apprenticeship program in your occupations that need talent.